I’ve heard of Konrath who blogs prolifically about self publishing, but I’ve not read him before. Whiskey Sour is his debut novel. I liked this book about a police detective, Jack, tracking down a serial killer. The chapters alternated between Jack’s and the serial killer’s point of view. The chapters with Jack were very funny with witty dialogue and contrasted with those of the serial killer, which were chilling and gruesome. On the whole this juxtaposition of humour and gore worked for me – I felt the balance was about right. There were a few occasions where this balance was tipping too far into satirical comedy, for example with the FBI agents. Portrayed as a pair of fools and while producing some great laughs, they really weren’t credible. I thought the pace was excellent – short chapters always focused on the plot with few digressions or detailed descriptions. The overall length at 288 pages is just right and I read it in a few hours. One minor quibble – Jack’s (short for Jacqueline) actions and thoughts sound too much like a man for me. Overall 4 stars. My Librarything giveaway competition has just ended. 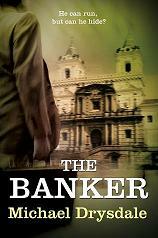 64 members entered and 10 lucky winners will receive an ebook copy of The Banker.